Over the weekend, two students from Maui High School showed their skills in making car repairs to win the 2015 Ford/AAA Student Auto Skills State Competition. Maui High has sent a winning student team to the national competition for many years. AAA Hawaii sponsors the competition with Ford Motor Company as part of its educational efforts to attract more young people to the automotive profession. 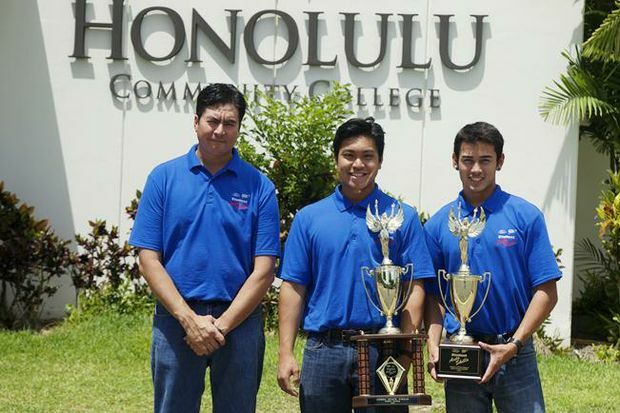 Joseph Burger and David Casayuran will represent the Aloha State and advance to the 2015 Ford/AAA l Student Auto Skills national finals to be held in Dearborn, Mich., in June. There they will compete against student teams from 49 other states for the national title and $11 million in college scholarships and prizes. The pair’s instructor, Shannon Rowe, will accompany them. The use of advanced technology in automobiles is expected to lead to new opportunities for repair technicians with specialized skills, according to the U.S. Dept. of Labor. As automobiles continue to increase in sophistication, the industry requires workers who can use computerized equipment and work with electronic components, while still maintaining strong traditional automotive skills with hand tools. Six student teams competed in the state event where students diagnosed and repaired problems in a 2015 Ford. Problems ranged from faulty wiring to malfunctioning electronics, the same issues automotive technicians face on the job daily. The competition winners were determined by the combination of their score in an online qualifying exam and the team’s performance in Saturday’s hands-on competition.